Jeremy Corbyn has rejected calls for his resignation as he questioned the timing of the vote of no confidence submitted by Dame Margaret Hodge. The Labour leader said the intervention was inappropriate due to "massive political issues" which need to be dealt with following the Brexit result. 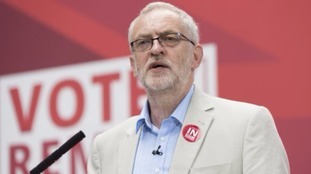 Mr Corbyn confirmed his intention to deal with the aftermath of Britain's exit as party leader. I'm carrying on. I'm making the case for unity, I'm making the case of what Labour can offer to Britain, of decent housing for people, of good secure jobs for people, of trade with Europe and of course with other parts of the world. Because if we don't get the trade issue right we've got a real problem in this country. The Brexit fallout: Can Corbyn feel comfortable? Kara Terry, a pet sitter and dog walker from Lincoln, says she chose to vote Leave because she wants the UK to be able to "govern its own destiny." Ultimately I decided to vote out in the EU Referendum, many because I believe by coming out of the EU, Great Britain will be better placed to make its own decisions, and govern its own destiny. I have one new certainty - it is that nothing will ever be the same again. The leader of Hull City Council has released a statement saying the council is focusing on ensuring investment will continue flowing into the city after the country leaves the EU. Following the referendum result, Hull City Council remains completely focused on safeguarding the huge investments and developments now flowing into the city. In particular, we want to secure the long-term future of our new, green energy industries and to ensure that Hull is well placed to maximise the potential of its year as UK City of Culture. As a major international trading port, our relationship with Europe is critical to maximising the prosperity of the city, Yorkshire and the Humber and, indeed, the UK. Whilst we must wait to see what the timetable and negotiations around the UK’s exit will bring, we are determined, working with our businesses and other stakeholders, to do everything possible to ensure that Hull maintains the momentum of regeneration and job creation that is now happening in the city. The multi-millionaire head of the LNT Group which owns supercar manufacturer Ginetta said he was surprised the results of most of the polls predicted a victory for the remain campaign. Lawrence Tomlinson says the decision to leave will be good for business both big and small. I think we have got a Government now with a clear mandate that needs to enforce a very strong divorce, if you want to call it, from the EU. I have many friends in Europe who I will continue to trade with, and it is important that we stay friends with people in Europe, but we must not end up with a poor deal, we must remain firm because remember, they need us, just as much, if not more, than we need them. There's a difference between what's actually happening and the reality of real businesses and gambling, so we have seen big swings in the currency. It will settle down at a reasonable number. It seems it is doing that already, after the hysteria of this morning, but other than that I think it will be business as normal next week. Finance expert David Scott says the Leave vote could trigger a global recession. Yorkshire's leading companies saw share prices plummet this morning but Mr Scott says the problems for the country could get far worse. The global economy never recovered from the 2008 recession, now things are coming home to roost. Us voting to leave is going to unleash tensions which could cause chaos within Europe. The global recession was coming, the events of our referendum have just brought it forward. Two Labour MPs have submitted a motion of no confidence in party leader Jeremy Corbyn. Margaret Hodge tabled the motion, her office has confirmed. It was seconded by Ann Coffey. Earlier, Labour Leave campaigner Gisela Stuart used a victory address to call on party leaders to "reflect on how they represent the views of voters." Without naming Mr Corbyn, she said: "It is now incumbent to all party leaders to also reflect to what extent they are representing and reflecting the views of the voters."